An appeal of a rezoning request at 1882 N. Starr Drive. 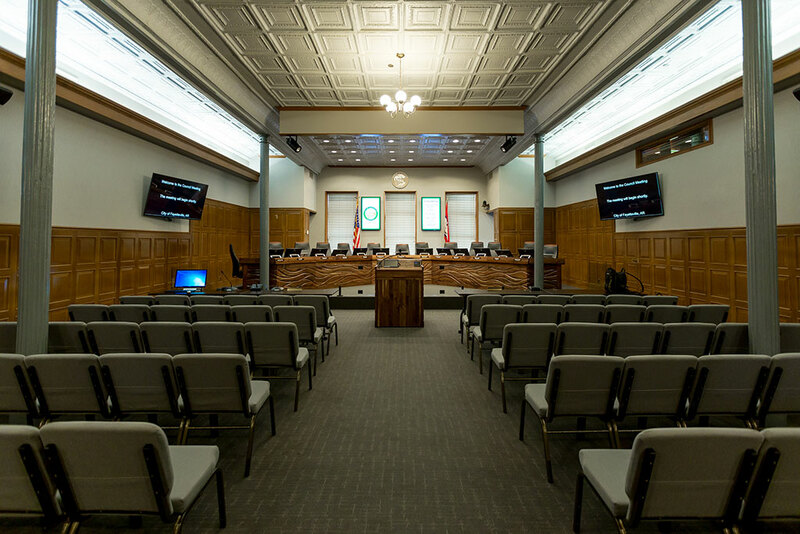 A meeting of the Fayetteville City Council began at 5:30 p.m. Tuesday, Jan. 15, 2019 inside room 219 of City Hall, located at 113 W. Mountain St. in Fayetteville. 1. Presentation of the City of Fayetteville Martin Luther King Brotherhood Award – Presented by City Attorney Kit Williams to Brian Pugh, the city’s waste reduction coordinator. 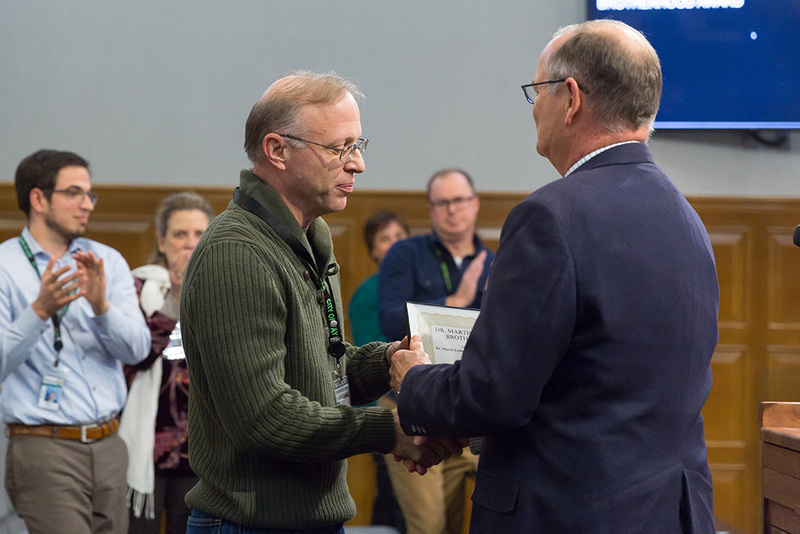 Kit Williams presents the award to Brian Pugh, the city’s waste reduction coordinator. Jordan delivers the state of the city address. 2. Bid #19-15 Holtzclaw Excavating, Inc. (Details): A resolution to award Bid #19-15 and authorize the purchase of waste disposal services for construction debris from Holtzclaw Excavating, Inc. in the amount of $15.00 per load as needed through the end of 2019. 3. 2019 Overlay and Sidewalk Projects (Details): A resolution to approve the Transportation Division Overlay and Sidewalk Projects List for 2019. 4. MSI Consulting Group, LLC (Details): A resolution to authorize the purchase of annual software maintenance from MSI Consulting Group, LLC for virtual justice software used by the District Court, Police Department and the City Prosecutor Division in the amount of $21,600.00 plus applicable taxes, and to approve a 5% project contingency in the event additional licenses are needed. 5. Fayetteville District Court Equipment Upgrades (Details): A resolution to approve a budget adjustment in the amount of $25,000.00 recognizing revenue from the Court Automation Fund for upgrades to the servers, software, computers, and related technology equipment used by the Fayetteville District Court. 6. NEOGOV Annual Software Maintenance (Details): A resolution to authorize the purchase of annual software maintenance from GovernmentJobs.com, Inc. d/b/a NEOGOV for the city’s human resources software in the amount of $24,707.03 plus applicable taxes. 7. Walker Family Residential Community Complex (Details): A resolution to approve a contract with Seven Hills Homeless Center to provide funding assistance in the amount of $57,000.00 for maintenance and repairs at the Walker Family Residential Community Complex in 2019. 8. 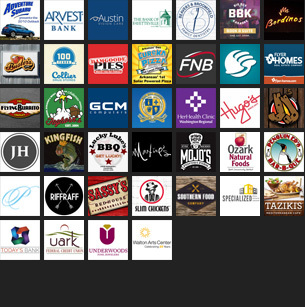 Something Different, LLC (Details): A resolution to authorize a 10-month contract with Something Different, LLC, with automatic renewals for up to four one-year terms, pursuant to RFP 18-16, to provide for operation of the concession stands at Kessler Mountain Regional Park Soccer Complex, Gary Hampton Softball Complex, Lake Fayetteville Softball Complex, and the Wilson Park Pool. 9. Environmental Consulting Operations, Inc. Amendment No. 5 (Details): A resolution to approve Amendment No. 5 to the contract with Environmental Consulting Operations, Inc. in the amount of $66,255.00 for wetlands mitigation site monitoring and management in 2019. 10. CH2M Hill Engineers, Inc. (Details): A resolution to approve an amendment to the 2018 contract with CH2M Hill Engineers, Inc. in the amount of $95,339.16 to reconcile costs incurred in overhauling belt filter presses at the Noland and West Side water resource recovery facilities, and to authorize a payment in that amount. A resolution to approve Amendment No. 1 to the professional engineering services agreement with Garver, LLC in the amount of $80,100.00 for additional design and construction phase services related to the Meadow Street Parking Deck Rehabilitation Project, to approve additional project contingency in the amount of $8,010.00, and to approve a budget adjustment. The Meadow Street Parking Deck was constructed in the late 1970s in conjunction with the construction of the (then) Hilton Hotel. Restoration work was performed on the deck in 2005, but staff said more recent observations identified several maintenance issues that have developed since then. The work includes replacement of metal stair treads, demolition and complete replacement of both stairs serving the deck, repair and patching of concrete and stucco surfaces, crack repair, painting, and several other items. Staff said since construction began, some unforeseen conditions have appeared which require more work. This amendment only includes the fees associated with the additional engineering work. Preliminary cost estimates for the actual construction are about $230,000. However, $88,000 worth of work is estimated to be removed from the original plan, resulting in an anticipated net additional construction cost of approximately $142,000. That item will come to the council at a future meeting. The resolution was passed by a vote of 8-0. An ordinance to waive formal competitive bidding and accept a repair quote of $33,497.00 plus applicable taxes from Andritz Separation, Inc. to repair belt filter presses at the Noland and West Side water resource recovery facilities. Staff said the equipment is 10-15 years old, and the work is needed to continue daily processing of water and sewer solids. There was no public comment. Kinion said the item was approved by the council’s Water, Sewer and Solid Waste Committee. 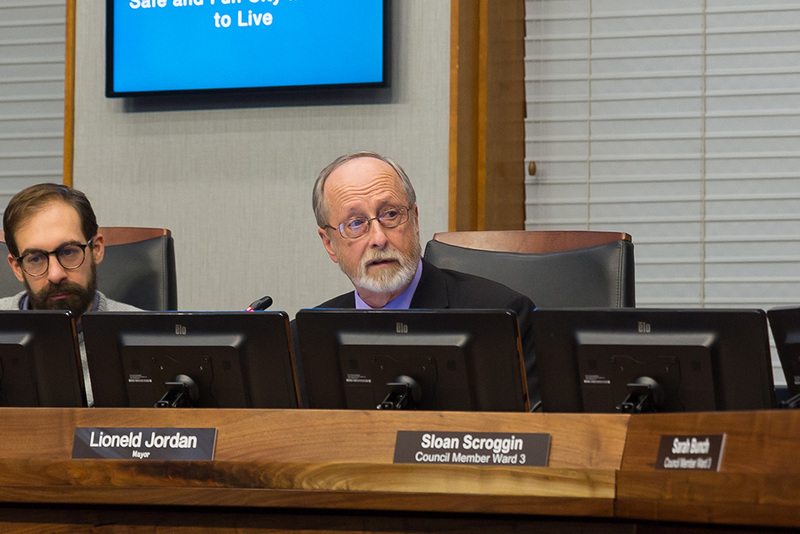 The ordinance was advanced through all three readings, and was passed by a vote of 8-0. An ordinance to waive the requirements of formal competitive bidding and approve the purchase of two macerator pumps for the West Side and Noland water resource recovery facilities from Ovivo USA, LLC in the total amount of $47,800.01 plus applicable taxes. Staff said the equipment has experienced internal failure, leaving the preliminary treatment process without back-up redundancy. The cause of failure is believed to be normal wear. An ordinance to waive competitive bidding through 2022 and approve the purchase of utility locating services for 2019 from Arkansas One-Call System, Inc. in an amount not to exceed $30,000.00. 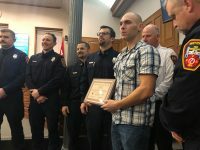 The company provides utility locating services for the Water & Sewer Department to make sure that city employees don’t damage other utilities while installing lines and taps and performing repairs on the water and sewer system. An ordinance to waive competitive bidding and authorize an extension of the contract for parking payment services with PayByPhone Limited through 2022. The company provides the software needed to allow customers to pay for parking using mobile web, smartphone, and smartwatch apps. Staff said pay-by-phone transactions has increase by about 300 percent between 2014-2018 which has resulted in an increase in corresponding transaction fees. The fees exceeded $20,000 for the first time, thus requiring City Council approval of this agreement. An ordinance to rezone that property described in rezoning petition RZN 18-6380 for approximately 1.20 acres located at 1882 N. Starr Drive from RSF-4, Residential Single Family, 4 units per acre to NS-L, Neighborhood Services-Limited. The property was originally used for a commercial office and parking lot on county land before it was annexed into the city. The building and property has consistently been used for commercial purposes since its original development. 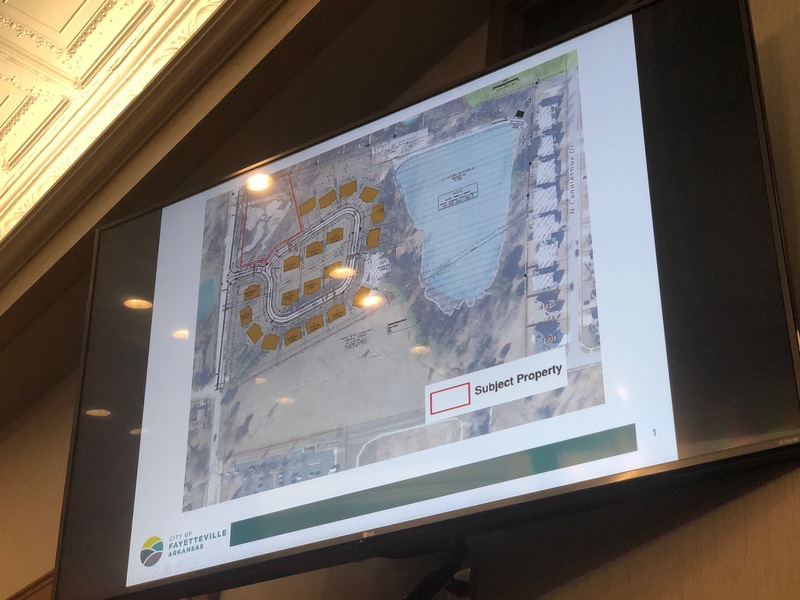 It is surrounded by residential homes, but city planners are in favor of the requested rezoning, because they said it would not offer the opportunity to develop significantly larger structures that would be out of scale with surrounding homes. The Planning Commission, however, denied the request after five commissioners voted against the application (3 voted in favor and 1 was absent). Kinion said he’s in support of the request because it’s an established property that’s compatible with the surrounding homes. Bunch said she’s not heard from anyone who is against the rezoning, and said she believes the requested zoning is a good fit for the property. Council member Scroggin, who was on the Planning Commission and voted against the request, said he believes the president of the nearby neighborhood association doesn’t know that the denied rezoning request has been appealed to the council, otherwise he would be here tonight to comment. He said the commission’s decision was based upon the potential for further development of the land. Marsh moved to send the item to the second and third readings. Kinion seconded. The motions passed 8-0. Turk said she thinks the item should be held on the second reading to allow the public more time to weigh in. Marsh declined to retract her motion. The motion to move to the third reading failed 2-6 (only Marsh and Kinion voted in favor). The ordinance was left on the second reading. The discussion will continue on Feb. 5. – Two “studio session” meetings are planned to discuss possible design elements for the northern part of the 71B Corridor project. The sessions are scheduled from 5-7 p.m. on Tuesday and Wednesday (Jan. 15-16) at Christian Life Cathedral, 1285 E. Millsap Road. – Payments made to the city this Thursday (Jan. 17) will only be available on a limited basis. – The mayor’s state of the city address is available on the city’s website (we also have it here). 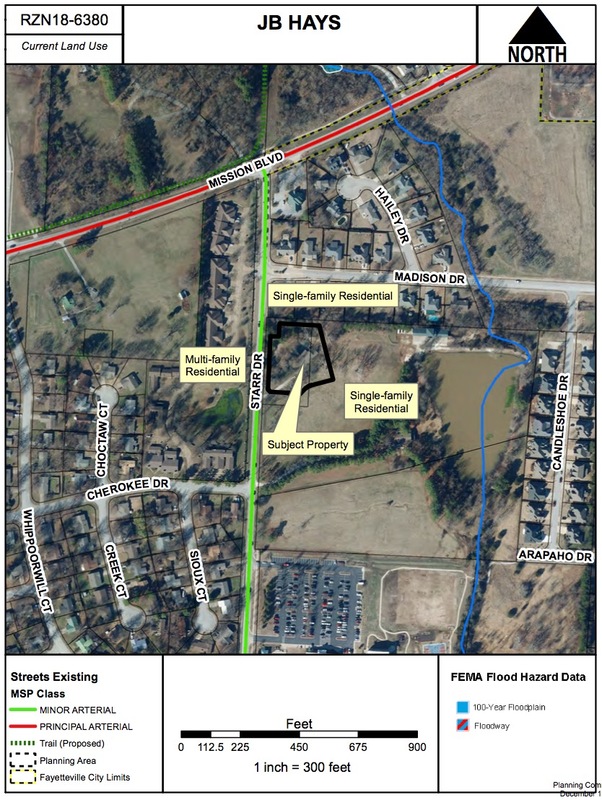 – Officials will give an update on the progress of the city’s flood management study at one more meeting this month in Fayetteville. This meeting was adjourned at 7:05 p.m.